Red Jewelry and Hearts for Valentine's Day - Perfect Choice! It's that time again. Valentine’s Day is just around the corner. That is when you go to the grocery store on February 13, and can't buy your groceries because the men are taking all the check out space waiting to pay for flowers and chocolate. Be creative men! Long after the flowers have faded and the chocolates have been devoured, a piece of jewelry will give pleasure to the wearer, and remind her of your throughfulness. My stores - Vintage Jewelry Lane, Vintage Jewelry Mall, and Carolina Collections Vintage Jewelry - all have a great selection of both heart jewelry, and red jewelry. All perfect for your special someone on February 14. Here are some of my top picks for unique, out of the ordinary, and affordable gifts for the special someone in your life. Step outside the (candy) box guys. She will love you for it! I didn't realize Utube would be a place for videos concerning vintage jewelry. Much to my surprise, I discovered this one yesterday. It's a wonderful video about the history of Vintage Costume Jewelry designers, such as Schiaparelli, Hattie Carnegie, Vendome, Miriam Haskell, Marcel Boucher, Hobé, Weiss, Eisenberg, Kenneth Jay Lane, Florenza, Trifari, Mazer, Weiss , Stanley Hagler, Mazer, Coco Chanel, Renoir Matisse, and others. The video discusses the popularity of costume jewelry after World War I, when precious metals and gemstones became scarce. The video even discusses bakelite jewelry, copper, and jelly belly jewelry. The author of the video, Gail Gupton, talks about most of the major vintage jewelry desginers, and gives some dates and design styles that they used. It is a great video and well worth taking the time to listen to it. 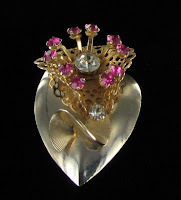 After you listen to the video, be sure to also visit my website, Vintage Jewelry Lane, for a wide selection of vintage jewelry from most of the designers that the video mentions. Today's post will continue our series devoted to various aspects to consider when putting together a vintage jewelry collection. In the last chapter we talked about the creative use of metal settings. Today we will discuss the various types of clasps used on vintage necklaces and bracelets. It is hard to specifically date a piece of jewelry by the clasp alone, unless it is marked in some with with a designer hallmark. The reason for this is that most of the clasps used on vintage jewelry are also used on modern pieces. 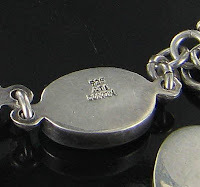 Condition of the metal and other design techniques in the piece should be used in conjunction with a clasp to try and narrow down the date. Vintage jewelry necklaces were made with many styles of clasps. Most notable were spring ring, hook clasp, box clasp, fold over clasp, and fish hook clasp. Others used, but not as commonly, were barrel clasp and toggle clasps. 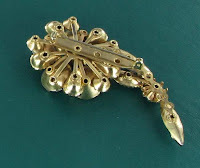 Lobster claw clasps were a later invention, so they are not found on vintage pieces, unless the clasp has been changed at some point. My favorite type of vintage clasp is the box clasp. It came in a myriad of styles, often with beads, rhinestones or other embellishments which match the rest of the necklace. The were made with a small box which had a tab which was inserted into it. The following photos show why it was so popular. The design ideas are endless. Many box clasp were found on jewelry before 1950. 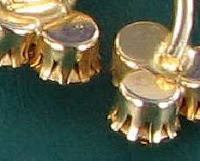 Spring ring clasps were commonly used. They came in two styles - one with a small tab to open the clasp and the other with just a small lip which can be swung back to create an opening. Spring ring clasps are still used today, but not as often. They have been mostly replaced with lobster claw clasps which are easier to open and close. 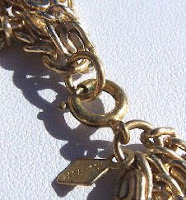 Hook clasps were often used on multi strand necklaces from the 1950s and 1960s. They were made of a metal hook which either "grabs" a bead in a dangling strand, or hooks in to a metal chain. The latter is still commonly used, but the former usually dates a piece as a vintage one. A fish hook clasp is made with a small hook which is inserted into a metal finding, often a pointed oval shape. 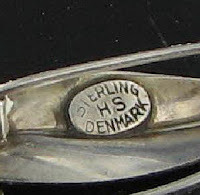 Good vintage fish hook clasps were often sterling silver. Modern metal ones are lighter in weight and made from goldtone and silvertone metal. Fold over slaps were used for many vintage mass produced pieces. The underneath part of the clasp was a great place to put the designer hallmark. 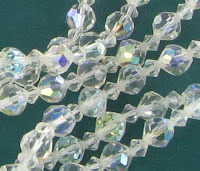 They were commonly used on necklaces and bracelets. 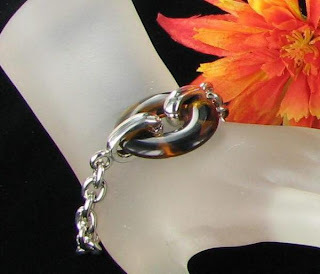 On a bracelet, a fold over clasp was often used in conjunction with a safety chain to help prevent loss of the bracelet if the clasp open while the piece was being worn. This type of clasp was popular in the 1940s and is still used today. Finally, barrel clasps and toggle clasp were used. These are often used today, so the metal condition is important to note when trying to date a piece with this type of clasp. Most older ones have developed a sort of brass like patina as they age. If you see shiny goldtone or silvertone barrel clasps or toggle clasps, the piece is likely to be a newer creation. As with other findings and stones which make up a vintage piece, condition of the clasp is important when you decide whether to purchase the jewelry item. If the metal is worn, the value of the piece is diminished, although clasps are one of the easiest findings to replace. Have fun checking out your necklaces and bracelets to see what type of clasp that your jewelry has! Check back soon for the next chapter in this series which will deal with clasp types used on vintage jewelry pins and brooches. Vintage Jewelry Lane has a wide range of vintage necklaces and vintage bracelets with all of these types of clasps. Be sure to check out the selection sometime soon. 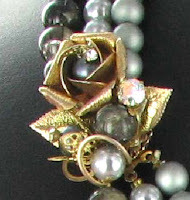 I love to write about the creative uses of jewelry that I personally see, or read about online. I always check out the blogs of note from google to see what the creater of the newest addition like to write about. Imagine my surprise to find that the blog "Tablescaping," which talks about creatively setting a dinner table, had a jewelry themed blog. 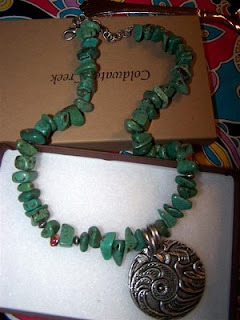 Zoey, the author of the blog, bought this lovely jade and silver necklace, wore it to work on Wednesday and then, on Saturday, she found a creative use for it on her dining room table. She calls this her "Aqua and Black Tablescape." 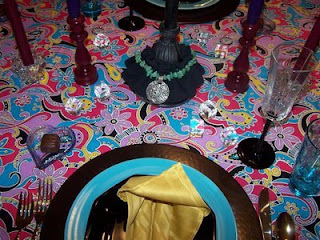 She put together an interesting table setting with bright colored wild fabric, a neat lamp (upon the base of which she draped the necklace), and dinnner ware that picked up the colors in the tablecloth. The end result is shown below. She has other pictures on her blog showing the step by step process. The next time you have a dinner party, be sure to check out Zoey's Tablescaping blog for some creative ideas on your table setting. Can You Make a Pair of Earrings in 30 Minutes or Less? Lark Books has a contest which ends soon. Top designers are being challenged to create a pair of earrings that can be made in just 30 minutes! Proposals are due January 26, 2009, so you only have a few days to get ready! The winning jeweler will be paid to contribute their talent and the end results are sure to reveal amazing creativity and technical skills. The company will showcase 50 designers with their step by step creations. Accept the challenge! Download an entry form here. Sounds like a fun contest. Be sure to heck back later to see the winning designs! I have a fascination for all things metaphysical. I read my horoscope, enjoy a tarot reading, meditate every day. Some of my interests are for fun, and some are part of my spirituality. I have a strong conviction that the mind is capable of healing all sorts of diseases and ailments. I have used various healing techiques with success on more than one occasion in my life. So, when I started my jewelry blog, it was natural for me to start researching the healing qualities associated with various gemstones and jewelry. Copper has long been associated with various healing qualities, particularly in the treatment of arthritis. The legends of using copper as a form of pain relief dates back some 10,000 years. Copper is a wonderful conductor of electricity and heat, so many believe in copper's power to heal the mind and body, based on these energy conducting properties. 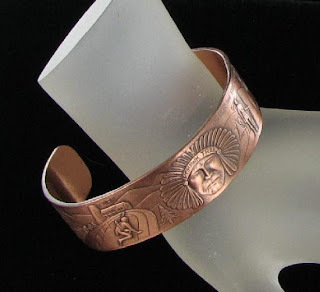 The metal also lends itself to spectacular jewelry design techniques such as this stuning Mohawk Trail Native American copper bracelet design. During the 1970s, the use of copper as a healing agent began to increase in the US. In addition to the relief of pain from arthritis, copper is also thought to promote the smooth function of the glands, to alleviate cramps, reduce inflammation, aid in blood circulation, and to ensure that the joints remain in good condition. Notable early designers of vintage copper jewelry are Rebajes, Matisse and Renoir. Both have resource books devoted to their designs. One particular book on my wish list at Amazon.com is Copper Art Jewelry: A Different Luster. 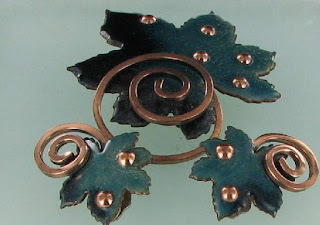 My website Vintage Jewelry Lane has a whole page devoted to vintage copper jewelry. My latest acquisition is this lovely copper leaf set by Matisse. This pretty set is an outstanding example of the enamel on copper jewelry produced during the 1960s. It is a book piece featured in both Copper Art Jewelry and Julia Carroll's book Collecting Cosutme Jewelry 101. All pieces are signed and it is in wonderful condition with very little wear. You can add this to your vintage jewelry copper collection for $110.00. Today's post will continue our series devoted to various aspects to consider when putting together a vintage jewelry collection. In the last chapter we talked about the creative use of stones. Today we will discuss the various types of settings used. At the top of the list is a rhodium plated setting. It was extensively used by the better jewelry designers. Rhodium is a hard metal in the platinum group and it wears extremely well. Two well known designers who used platinum settings often are B. David, and Sarah Coventry. As you can see from the picture to the right, a rhodium setting is smooth and every even. It has a luster to it that normal silvertone settings doesn't have and it doesn't tarnish over time and is very corrosion resistant. 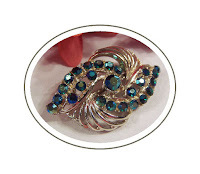 Open back settings for rhinestone jewelry are also found on better vintage jewelry pieces. The most famous designer of this type of setting is DeLizza and Elster who made the famous Juliana Jewelry. (you can view some verified Juliana jewelry pieces at The DeLizza & Elster Jewelry Education Site. Most open back settings also use high quality unfoiled glass rhinestones, although I have seen foiled pieces in openback settings too. Riveted back settings were used extensively during the 1950s -1960s. In this setting, a small rivet is visible on the back of each of the cups that hold the rhinestones. 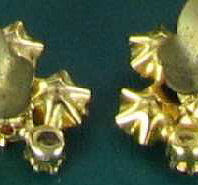 Many designers used this setting, but pieces from Austria are often made with this design technique. 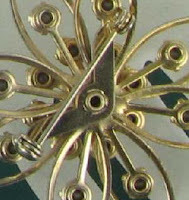 V Clasps were also another design technique often used during the 1950s. The back of this early vintage brooch uses both the riveted back setting and an early V Clasp. There is a special type of rhinestone setting that I particularly like. It is found on many pieces from Austria. This special cup setting has crimped edges which are somewhat flayed around the edges. A version of this is called the pie crust setting for the similarity to a pie crust in baking. 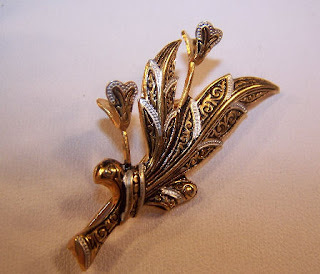 Filigree settings were very popular with many vintage jewelry designers. They have had a resurgence with some newer designers such as 1928, but the older settings are notable because the beads and pearls were often wired onto these filigree settings. Japan and Germany used filigree settings often, but the most notable designer who used them extensively is Miriam Haskell. The quality of a Haskell piece is unmistakable and a staple of any top quality vintage jewelry collection. 1. Collecting Vintage Jewelry - Where do I start? 2. Collecting Vintage Jewelry - What is the condition? 3. Collecting Vintage Jewelry - Type of Stone settings. 4. Collecting Vintage Jewelry - The Creative Use of Stones. Check back soon for the next chapter in this series which will deal with clasp types used on vintage jewelry. Multi Strand Necklaces - Fill up that neckline! I've seen a big increase in the number of multi strand necklaces that I have sold recently. They were hugely popular in the 1950s and 1960s and many are marked Japan and West Germany. There also seems to be a resurgence of this style with contemporary designers too. 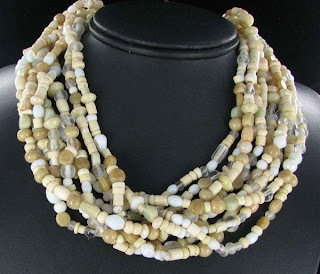 The necklaces come in a myriad of bead types but all have one thing in common - they have more than one strand, normally attached with special findings at the neckline so that the strands sit evenly in rows. Some, like this interesting artisan glass bead necklace, are crimped at the neckline for more of a bunched look. It's perfect for the rich fashion colors forecast for winter 2009 by Fashion Trendsetter. It's muted tones would look wonderful on any color, but would be great with red, which is a very popular color right now. 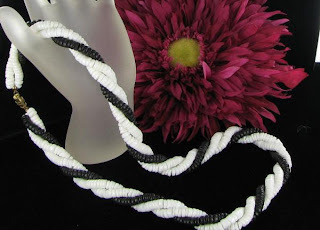 Other multistrand necklaces of interest are those which actually twist the strands. Mainly done in glass, these torsade necklaces give a neater look at the neckline. Here is one featuring three rows of black and white glass beads. Imagine this with a black jacket and white open necked blouse. It's available in my Carolina Collections Vintage Jewelry store at a bargain price of only $11.99. It isn't just necklaces that lend themselves to the multi strand design. Many bracelets are made this way. Visit my Ebay store Carolina Collections Vintage Jewelry to view a wide range of multi strand styles - all at bargain prices. Full set, part set - What is a parure? Married set, semi parure, demi parure, full parure? How does one know which word to use when describing a vintage jewelry set? It can be confusing because they are often used interchangeably by various sellers. To be absolutely accurate, when the word parure is used, the pieces must have originally been designed to be worn together. Many designers made sets of 2, 3, 4 or even more pieces of the exact same design. Sarah Coventry is a well know designer of parures. The sets would often contain a brooch, bracelet, pair of earrings, necklace, and ring. The terminology used to describe them would depend on how many pieces of the original are being offered. Other designers made just two pieces to be worn together, such as a brooch and matching earrings. If this is the case, the set can be correctly called a parure. If the original set contained well more than two pieces, the correct term for two pieces from the line is a semi parure. 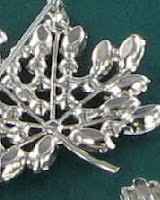 If all pieces are in the set, it is correctly called a full parure. Demi parure is used when only two pieces of the original set of three are shown. However, demi parure is commonly used for any set of two pieces, and full parure for three or more. This stunning aurora borealis set by Sarah Coventry is called "Blue Lagoon." It was originally a hostess set of several pieces. The set featured is just the brooch and earrings. It is a correctly described as a semi, but is also often referred to as a demi parure. It is one of the most in demand sets from the Sarah Coventry line. A married set is used when two similar pieces are offered. For instance, one might have a black glass beaded neckace which is teamed up with a pair of black earrings of a similar style. The pieces may be the same designer but not originally made together, or they may be from two different designers, but look well matched. The following set is a good example of a married set from two different designers. It features a dogwood flower design. The brooch is marked Trifari and the earrings are marked Avon. They are not an exact match, but still look very nice together. No matter the correct terminology, one thing is sure. Parures, or sets, are lovely and make more of an impression than single pieces. 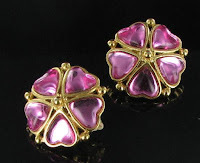 Be sure to check out the full range of parures from Vintage Jewelry Lane's collection. The two sets featured here are included, as well as many other design, and makers. Valentine's day is just around the corner. So now is the time to find that perfect expression of love for the special person in your life. Jewelry always makes a special gift for a loved one at any time of the year. 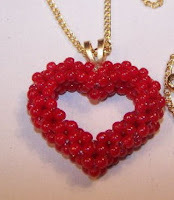 But Valentine's day lends itself to this expression of love because so many jewelry items can be heart shaped. 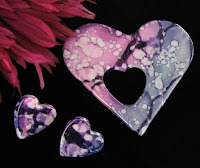 Hearts lend themselves particularly well to brooches and pins. 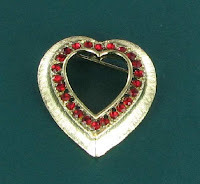 Whether it be rhinestones, pearls, or plain metals, a heart brooch makes a perfect "I love you" gift. Some even incorporate additional words on them, such as mother and grandmother. 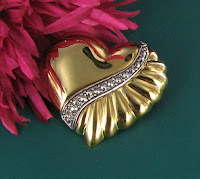 Heart lockets give your special one a place to put a small picture or lock of hair to remember you by. I've also seen lockets that are shaped like hearts which have small areas inside for solid perfume. Some designers use figural motifs in their designs. I recently listed a a really cute pin in my store in the shape of a tic tac toe design, but the Os were small hearts. So cute! There are charm bracelets with love themed charms, or heart charms, such as this pretty charm bracelet with both pale green and dark green glass heart charms. But nothing says "I love you" quite the way that this stunning vintage charm bracelet does. 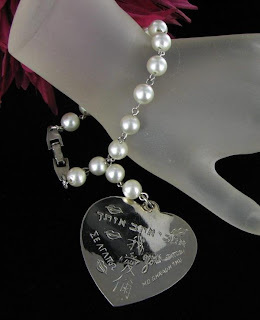 It has a hand wired faux pearl strand with a single large heart. 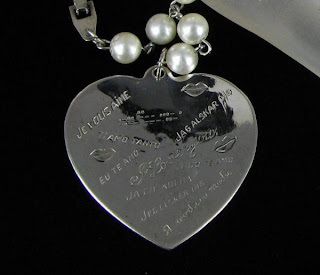 The heart is double sided and says I love you in 15 different languages. I'm not an expert on languages. I know quite a bit of French, and some Italian and Spanish and I can recognize a few other languages, so I had to go searching. plus a few more I can't figure out! Don't go the flowers and candy route this year. Give the personal gift of a piece of jewelry. This stunning bracelet is featured in my ebay store Carolina Collections Vintage Jewelry with a price of only $29.99. Say I love you to the special person in your life, in the language of your choice! 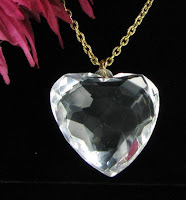 The store also has a wide range of all types of vintage and new heart jewelry for all tastes and budgets. 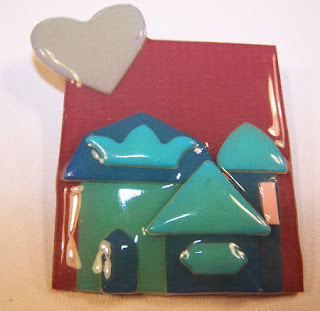 Creative Use of Christmas Tree Pins! I love Christmas. I am the original Christmas fairy. I go all out in the decorating department each year and have a huge collection of Christmas collectibles. One of my favorite types of jewelry is also the Christmas tree pin. I have heard of people doing very creative things with these pins. Some people put them into shadow boxes. Some people use ones with broken clasps and other problems to make into Mosaic Christmas tree decorations. But never have I seen such a creative use of the pins as that which a customer of mine told me about. Adam Wide from the UK - magician, then comedian and now creative consultant for many large organizations, such as the Dubai multimillion dollar theme park - Global Village, uses his pins in a unique fashion. Every year, Adam conducts a small group of comedians who go out Christmas carol singing around the nobby, trendy market ares of London for a charity called "Crisis at Christmas." This charity does its part to make sure that homeless people in Londan to have a good Christmas day. This past Christmas, the charity raised over £1,850 from their "enthusiastic, but often terrible four-part harmony singing", as he puts it. Here is Adam, on his Harley Motorcyle all dressed up like Santa Claus. 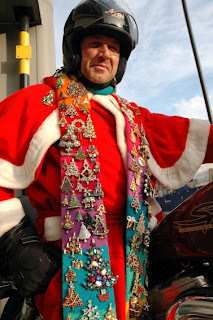 He tells me that his scarf weighs a ton and has 150 Christmas tree pins on it. Adam started collecting Christmas tree pins on a previous trip to Copenhagen, in 1984, where he got his first tree. This YouTube video of him as Clarence with Babs as Joy Pickles is an entertaining look at some of his comedy. If you look very closely in one of the frames, you can just see the original Copenhagen pin. His collection of Christmas tree pins was 750 at the last count, (before his recent purchase from me of several more). He also sent me a photo of some of the other pins in his collection. It is massive and very impressive. I would dare to say that this Santa Claus certainly causes quite a stir. Santa with Glitz! Vintage Jewelry Lane and Carolina Collections Vintage Jewelry both have a huge range of Christmas tree pins for sale. Your collection may not be as large as Adam's but one can always dream! Do you have an interesting story to tell about jewelry? Please email me with details and you may be featured as my next customer of note. 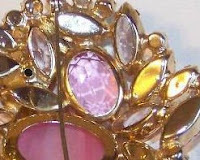 In a previous blog post, I talked about how undervalued glass is in the vintage jewelry collecting hobby. In this article and future ones, I'll talk about a variety of types of specialty glass used in the manufacture of vintage jewelry pieces. My personal favorite is milk glass. Wikepedia describes milk glass as an opaque, milky white or colored glass, that is blown or pressed into a wide variety of shapes. It is also used in dinnerware, lamps and vases. When used in costume jewelry, it produces a piece with a crispness not otherwise found. 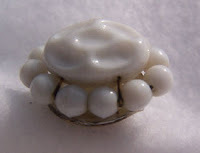 Early examples of milk glass vintage jewelry include pieces marked Germany, and Japan. Miriam Haskell was particularly fond of milk glass in her jewelry designs, and her pieces are much in demand and command high prices. Trifari also used white milk glass, particularly in marquis and navette shaped stones. 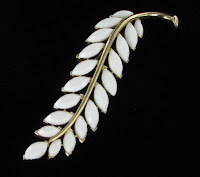 This gorgeous milk glass flowered brooch is a new addition to the Trifai page of my Vintage Jewelry Lane Website. It is so simple in design, but just elegant. Milk glass is used in all sorts of vintage jewelry. Japan and Germany made both earrings and necklaces - some single stand, but many with multistrands and fancy milk glass clasps. Germany and Miriam Haskell often used unique shapes of milk glass instead of the traditional oval or round shaped often used. Dimpled glass or "baroque" glass shapes like the one shown here were common. 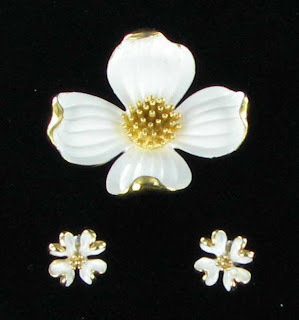 Some designers used petal shaped milk glass stones in earrings for a lovely flower petal effect. Not all milk glass vintage jewelry pieces were marked. Some of the nicest designs that I have seen use prong set milk glass stones in quality settings, but have no markings at all. Often, these are unsigned designer pieces. Designers often had pieces made for their high end lines with their signatures, and then had some other pieces for the lower price ranges with no markings. The pieces shown here and other lovely milk glass vintage jewelry pieces are available on my site Vintage Jewelry Lane site, or my ebay store Carolina Collections Vintage Jewelry, at very affordable prices. What would you like to see for articles in my blog? I was talking to a dear friend of mine the other day and mentioned that I had been doing a vintage jewelry blog. She isn't someone who wears much jewelry and isn't that interested in talking about it. Her comment was "you have picked the hardest topic to blog about!" I started thinking about topics for posts and had literally hundreds and hundreds of ideas in my head. But I love jewelry of all types, especially vintage jewelry. Email me with your jewelry question, or put it in the comments section below, and I'll be happy to research it and write it in a future post. It can be anything jewelry related, and doesn't have to be just about vintage jewelry, although I admit I don't know as much about newer jewelry. Perhaps your question will be featured next! Leopard Print is All the Rage Right Now! While I was shopping with my daughter for presents for her early January birthday, I couldn't help but notice that leopard print clothing is really a hot trend right now. We ended up buying a cute leopard print dress and black jacket and tights to go with it. Seeing the two colors together made me think about the leopard print accessories I have in my ebay store - Carolina Collections Vintage Jewelry. Imagine this leopard print bracelet worn with a plain black dress or black jacket and slacks. I also have the matching earrings and necklace for $19.99 for all three pieces. Who says you have to spend a lot of money to have the hottest fashion trends? Like the look but prefer a goldtone metal finish? I've also got a cute pair of leopard print earrings in a button style for only $8.99. Bring out the cat in you with these cute accessories and you will be right in style for winter 2009! Aurora Borealis Jewelry - How Old is it Really? 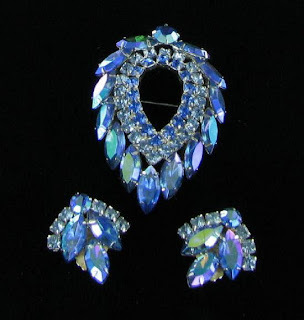 Full of fire and light, aurora borealis (AB for short) rhinestones and beads were a favorite of vintage jewelry makers. But don't be fooled by retailers who try to convince you that the piece of aurora borealis jewelry they are selling is from the Victorian, or Edwardian, or even Art Deco period. It isn't. In the early to mid 1950s, the Swarovksi Company began experimenting to give a lustrous aurora borealis coating on crystals to make them more radiant. The process was meant to simulate the effect of the Northern Lights, or the celestial Aurora Borealis. By 1955, the process was perfected by Swarovski, who also worked closely with Christian Dior in the design of jewelry with these stones. When you examine a rhinestone or glass bead which has this coating, you will see shimmering colors radiating from the beads in a variety of shades. Early colors had mainly a bluish coating, but over the years more and more variations in the coating color was perfected and the stones now have a wide variety of colors available. Jerry Smith from Beads and JSBeads.com has a wonderful chart of Aurora Borealis coating colors on his site. At first, the jewelry made from these stones was only available to the very wealthy, but the process was licensed for use by other manufactures, such as Corocraft, who used it in their Vendome line. Later, when plastic beads with this finish became the vogue, the jewelry became cheaper and more affordable by the general public. The use of Aurora Borealis stones and beads in jewelry was very popular until the mid 1960s, when it tended to fade from the manufacture of jewelry, only to have a huge resurgence in later years of the last century when vintage jewelry collecting started to become so popular. 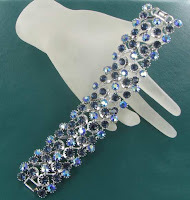 aurora borealis bracelet from my Vintage Jewelry Lane site is a lovely example of the blue coating. So, when you find a piece of jewelry with original aurora borealis stones, don't be fooled into believing that it dates from the 1930s or 1940s. Occasionally, you may find a patent number on the back of a piece which will specifically date it, but the patent will never indicate a piece earlier than 1955 unless the stones have been replaced. Okay, I admit it. I like astrology and other metaphysical subjects. The other night when I was surfing the web, I found a neat site that talks about various paranormal subjects. I came across a neat site called paranormality.com. It is an A-Z of Paranormal, Supernatural and Unusual Phenomena. One area of the website deals in dreams and makes an attempt to interpret objects or themes in them. The site is just for fun, but I had a look to see if they had any interpretation for jewelry items in dreams. The site had an easy to navigate dream dictionary in alphabetical order. I checked a few jewelry terms and found some interpretations for the following jewelry items. Jewelry: To dream of broken jewelry, denotes keen disappointment in attaining one's highest desires. If the jewelry be cankered, trusted friends will fail you, and business cares will be on you. Ring: To dream of wearing rings, denotes new enterprises in which you will be successful. A broken ring, foretells quarrels and unhappiness in the married state, and separation to lovers. For a young woman to receive a ring, denotes that worries over her lover's conduct will cease, as he will devote himself to her pleasures and future interest. To see others with rings, denotes increasing prosperity and many new friends. Necklace: For a woman to dream of receiving a necklace, omens for her a loving husband and a beautiful home. To lose a necklace, she will early feel the heavy hand of bereavement. Bracelet: To see in your dreams a bracelet encircling your arm, the gift of lover or friend, is assurance of an early marriage and a happy union. If a young woman lose her bracelet she will meet with sundry losses and vexations. To find one, good property will come into her possession. Earrings: To see earrings in dreams, omens good news and interesting work is before you. To see them broken, indicates that gossip of a low order will be directed against you. Vintage Jewelry Lane has a wide range of jewelry for you to dream about. Perhaps some of our pieces will be inspiration for your next dream! What is a Maker's Mark? Some vintage jewelry designer sign their pieces with various signatures on the back. These are called maker's marks. These markings can be part of the actual metal, or they can be on metal plates which are then soldered to the metal. Sometimes, a piece can be signed in a different way - perhaps on the front or back of a hand painted piece. In this case, the author will sign a piece with paint. However, most marker's marks are done in metal. These markings are sometimes referred to hallmarks, but a hallmark refers to an indication of metal content found on a jewelry piece. It can be alone or in combination with the mark of the designer. A maker's mark by itself is not considered a hallmark. Many maker's marks are fairly obvious - they are visible with the naked eye when you turn the piece over. Sometimes, though, a mark can be very tiny and you can find it just about anywhere on a piece, so it is important to examine the jewelry carefully to see if it is marked. I've seen signatures on the pin part of clasps, in tiny lettering on the edge of the setting, inside of a bale where a pendant hangs from a chain, on a clasp tag, and on an enlarged O ring near the clasp. They are found on the back of the clasps for necklaces and bracelets, on the underside of pendants and pieces of other necklaces, and backs of brooches. Designers do not always use the same marking. There are many designers who have used four, five, or even more, different marks through the years. The following are photos of a few maker's marks that you may have seen. These are from designers Sarah Coventry, Coro (sterling), Schreiner and Weiss. Not all vintage jewelry is marked but many are. There are notable designers who used only paper hang tags which were often removed when the piece was worn and then discarded. Juliana jewelry, made by Delizza and Elster, is probably the most well known design of this type. Other designers marked many of their pieces, but also made some which were not marked. To identify these, one needs a good knowledge of their design techniques. I'll cover some of these in a later blog. Vintage Jewelry Lane has a wide range of designer signed jewelry. Have a look to see if your favorite designer is featured this month.